First-quarter GDP data came out last week, indicating a small increase in economic growth. But I noticed that fixed investment was down in the first quarter, on the heels of a slight fourth-quarter decline as indicated by my gross output (GO) measure and the B2B (Business-to-Business) Index. A recession is looming in the United States, and that’s why the Fed is actively stimulating the economy with more easy money. In response to this weakness in B2B spending and a falloff in the earlier stages of production in the fourth quarter (mining, manufacturing and wholesale trade all declined), the Fed has postponed raising rates and has injected more money into the banking system. The money supply (M2) is growing at 7-8% a year. I believe that new money is going into the stock market and commodities (such as oil and gold). We remain 100% invested, and are handily beating the market in 2016. See www.markskousen.com. Last Friday, a standing-room-only crowd of more than 300 people showed up at the Cato Institute policy forum in Washington, D.C., to hear Steve Forbes, George Gilder and me talk about my Gross Output (GO) statistic and how the economy can grow faster. Both Forbes and Gilder are big fans of my GO measure of the economy. Gilder called it “crucial” to understanding how the economy works. Watch the Cato Institute policy forum here. In my 15-minute presentation, I pointed out that gross domestic product (GDP), the standard measure of the economy, leaves out a critical element — the supply chain, valued at around $20 trillion in 2015 (bigger than GDP itself). Let’s take the energy sector as an example. The production process starts with the “upstream” oil & gas producers… Then the “midstream” pipelines (such as Enterprise Products Partners, one of my recommended investments)… and finally ends with the “downstream” refiners and retailers (gas stations). All three stages of production are essential to the “make” economy and need to be measured. That’s what GO does. GO is truly a triumph in supply-side Austrian economics, and I was honored to make my presentation at the Hayek auditorium at Cato, since GO is a measure of Hayek’s triangle. In addition to discussing GO, Steve Forbes and George Gilder advocated a return to a fixed-exchange gold standard to encourage long-term growth. I’m convinced that deregulation and lower tax rates could do more to stimulate growth than going back to gold. I am recommending gold for the first time in five years. Is Las Vegas Killing the Golden Goose? Exclusive Manufacturers Accuse Banks of Hoarding Aluminum. Reform Opportunies Missed? Is Las Vegas (and Nevada) destroying itself as the entertainment capital of the world and as a tax haven? It still is income tax-free, but it recently passed a series of massive tax increases (biggest ever in its history) that included a gross receipts tax on business — a tax Nevada-based businesses have to pay even if they lose money. This tax increase was imposed to improve public education. How crazy is that? Now the Las Vegas hotels are getting into the act by pushing through mandatory increases in their room rates, new “resort fees” and even charging for self-parking. All of the Las Vegas hotels have conspired together to impose daily “resort fees” (as high as $32 a day!) to force hotel guests to pay for services they may not want or use, such as the Internet in the rooms (when they are out of their rooms most of the day), spa services, etc. We’ve had to encounter this new fee at Planet Hollywood and other conference hotels for FreedomFest, and we have fought hard to keep it from happening, or cut the rate to a low level. Finally, MGM Resorts have started to impose a fee for self-parking in a city that is famous for free parking. In fact, Las Vegas is the only major city I know of in the country that has no fees for parking. I hope the onerous fees backfire big time, because if tourists allow it to happen, I guarantee all the other hotels will follow suit. Las Vegas is shooting itself in the proverbial foot — maybe even in the head. At the Cato Institute event I spoke at on Friday, everyone was talking about the up-and-coming Nebraska Sen. Ben Sasse and his anti-Trump stance. He wants to see a third-party candidate emerge. I don’t think it’s going to happen at this late stage. 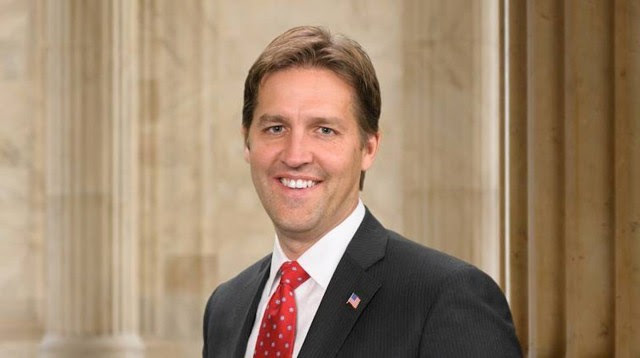 We are happy to announce that Sen. Ben Sasse will be joining us to speak at FreedomFest, along with Sen. Rand Paul (who has endorsed the Republican candidate). The debate will be “YUGE,” as Donald Trump puts it. The “early bird” discount for FreedomFest ended on May 15, but if you use this special code, I’ll give you $100 off the registration fee. Use code FF16Eagle to register and save $100: www.freedomfest.com/register-now. Or call toll-free 1-855-850-3773, ext. 202. We now have posted all of the special breakfasts, luncheons and the Saturday night banquet online. Alex Green and I will be doing the not-to-be-missed “Duel of the Financial Gurus” Saturday morning. Plan ahead to join me at The MoneyShow San Francisco, Aug. 23-25, Marriott Marquis. Eagle Financial Publications and I invite you to this three-day event that is focused on exploring successful strategies, key technologies and valuable tips for individual investors. Attend free as my guest to hear my presentations as well as those of my colleagues Doug Fabian. Bryan Perry and Bob Carlson, among other investment experts. Register free today by calling 800-970-4355 or sign up at http://goo.gl/QQWevw. Be sure to mention priority code 041171. In case you missed it, I encourage you to read my e-letter column from last week about whether free college education is a good thing. I also invite you to comment in the space provided below.